But can you ignore those bezels? The Google Pixel 2 shows Google now has clear vision for its flagship smartphones. The design is distinctive and has character, the camera continues to be outstanding, and the software it very intelligent. However, those bezels can't be ignored, so we'd go for the Pixel 2 XL. 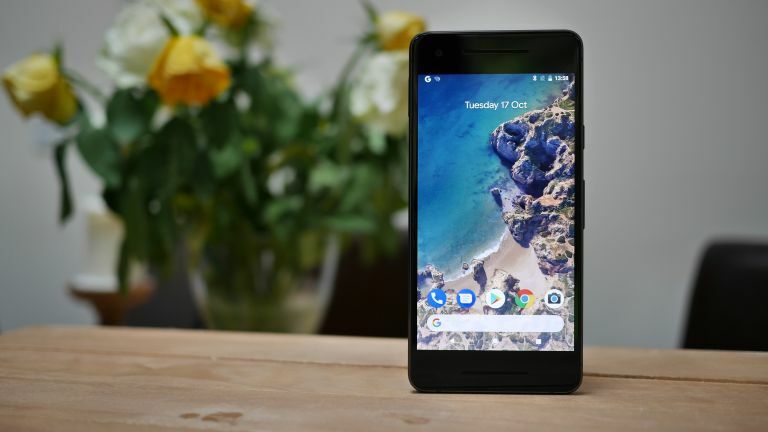 The Google Pixel 2 is here, and it seems Google is really starting to define its vision for the perfect Android phone: pragmatic, quirky design, with killer software. So exactly is new in Google's 2017 flagship? For a start, the camera has been upgraded, now with some impressive portrait effects, the design has been tweaked to make it more distinctive, and Google has improved the software in just about every way. But is it enough to stand toe-to-toe against the brilliant Samsung Galaxy S8 and iPhone 8? The design will likely be the Pixel 2's most divisive aspect. We'll start with the good news first. With a 5-inch screen and measuring in at 145.7 x 69.7 x 7.8mm it's a great size, and easy to use one handed. While last year's Pixel was a little too samey, the Pixel 2 is much more distinctive. It has a clear visual identity now, with a larger glass panel on the rear that stretches around the edges of the device, and attractive chamfered bezels. I really like the look of it - it's got a character which some phones lack. It's quirky. Of course, it's up to you whether you prefer this slightly eccentric design over the sleek and sophisticated iPhone, or, indeed, whether you're even bothered. Continuing on this 'anti-iPhone' theme, the Google Pixel 2 feels like it's made from plastic. Don't get me wrong, the Pixel 2 is very well made – it feels as solid as a rock. It's simply a stark duality to the almost ceramic-feeling iPhone. This does make it feel slightly cheaper than some competing flagship smartphones, but it also has it's positive points, for example, it's the most grippy flagship smartphone out there, and it seems more rugged. I was shocked at first (genuinely), but it has grown on me very quickly. But there is one aspect of the Google Pixel 2 which I can't excuse, and that's the gigantic bezels above and below the screen. I want to grab Google by the lapels and shout "What are those?! It's 2017!" They might have been excusable at the beginning of 2017, but not anymore. In fact, even at the start of 2017 those are some of the largest bezels I've ever seen - it's like Google is trolling us. As a side, it's worth noting there's also a Google Pixel 2 XL, which features a larger screen with much smaller bezels. We're 100-percent recommending you buy the XL instead, which is especially annoying if, like me, you generally prefer smaller smartphones. I'm genuinely disappointed. If you can live with them, then I'm happy for you. Those giant bezels make way for stereo front facing speakers, which sound pretty good, with a decent amount of separation. Google has banished the headphone port (you'll get a USB-C adapter in the box), but made up for it with a water resistance rating of IP67. And, finally on design - Google have tweaked the colourways available. The Google Pixel 2 comes in Kinda Blue, Just Black, and Clearly White. The Google Pixel 2 has been given a pretty significant upgrade in the display department. It now features a 5-inch AMOLED screen with a FullHD resolution (1080 x 1920 pixels). That means a pixel density of around 441 PPI. On paper that's identical to last year's Pixel, but in reality it looks much sharper and clearly more vibrant. The Pixel 2 new features and ambient 'Always On' display, which continues to show key information and notifications even when the screen is off. This is a nice touch but has been seen before – what's really impressive is that it'll also tell you what song is playing in the background, like an instant Shazam. Ultimately, while the screen is a big improvement over last year, it's really disappointing that Google hasn't made this an edge-to-edge display. There's nothing special inside the Google Pixel 2 – powering it is the same Qualcomm Snapdragon 835 and 4GB RAM found inside most other smartphones. Google will even admit this. It's a fast device, just as fast as every other flagship smartphone out there. Multitasking, playing music, watching video and browsing the web are all effortless. What Google wants to emphasise is the software running on this now-generic hardware. The Pixel 2 comes with an updated version of Google's Pixel launcher on top of Android Oreo. It features a smarter Google Assistant, and now Google Lens as well, which lets you search for things in a photograph. It's still very close to stock Android, but it comes with some beautifully simple changes which make operating easier, especially with one hand. Elsewhere in the specs department, the Google Pixel 2 comes with either 64GB or 128GB storage, Bluetooth 5, and a 2700mAh battery with quick charging. Despite the small battery, we found the battery life of the Pixel 2 is actually pretty impressive, easily lasting a day with standard use. It's worth noting, due to the metal design, the Pixel 2 doesn't feature wireless charging. That's not a major issue right now, as it's slow and not very prevalent, but we'd expect to see it in the Pixel 3. The original Google Pixel had quite simply the best camera in any smartphone for the best part of a year, so we were really excited to see what the Pixel 2 would bring to the table. On paper the Pixel 2's camera looks similar to the OG. You get the 12 megapixel sensor, but this time with an f/1.8 aperture rather than f/2.0. You've also got the added benefit of optical image stabilisation. Google's tinkered with the software, to improve the results and add extra features. The result is a big improvement, with the camera capable of taking some stunning shots, and, most importantly, reliably. The competition has closed the gap significantly, however, with the HTC U11, iPhone 8, and Samsung Galaxy Note 8 capable of taking some very impressive images. Unlike the many of its competitors, Google has decided against adding a dual camera setup to the Pixel 2. Despite that, it still features a portrait mode which blurs of background using machine learning (see 2nd image above). This works on both the rear and front cameras. The final image in the gallery above was taken using portrait mode on the front facing camera. We're really impressed with the results. The results aren't perfect (no one has really nailed this yet), but the results are very pleasing. It's a better solution than simply leaving this key feature out, which is what Apple does with the smaller iPhone. If you buy the Google Pixel you'll get three years of unlimited high-resolution uploads to the Google Photo cloud storage. We'll have to do some more in depth tests with the Pixel 2 and its competitors, but it's certainly lining up to retake its crown. The Google Pixel 2 shows Google now has clear vision for its flagship smartphones. The design is distinctive and has character, the camera continues to be outstanding, and the software it very intelligent. However, those bezels can't be ignored, so we'd go for the Pixel 2 XL.